When television people want snow and the weather isn’t cooperating, who do they turn to? Okay, that’s a trick question. The nice people at ABC’s Good Morning America featured one of our most popular products in 2006 – Blizzard in a Bucket. When a producer from Good Morning America called our distributor, Be Amazing! Toys, she wanted to “make snow” during an outdoors segment because New York City was unseasonably warm. If you’re unfamiliar with Insta-Snow, it’s a special powder that literally erupts into snow. Don’t get confused… it’s not real snow but it looks very realistic. 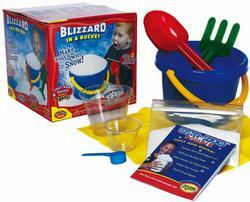 Blizzard in a Bucket is an early childhood science kit that uses the snow powder to replace ordinary sand. Thanks Good Morning America.